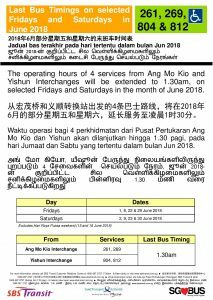 Shorter operating hours along the North South Line (NSL) between Woodlands and Ang Mo Kio will take place on selected days of June 2018 to facilitate additional engineering hours for intensive railway maintenance and improvement works. This will involve early closures and late openings along the NSL. 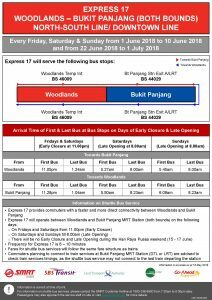 These closures in June 2018 are on top of full-day closures on the Bukit Panjang LRT between April to June 2018. 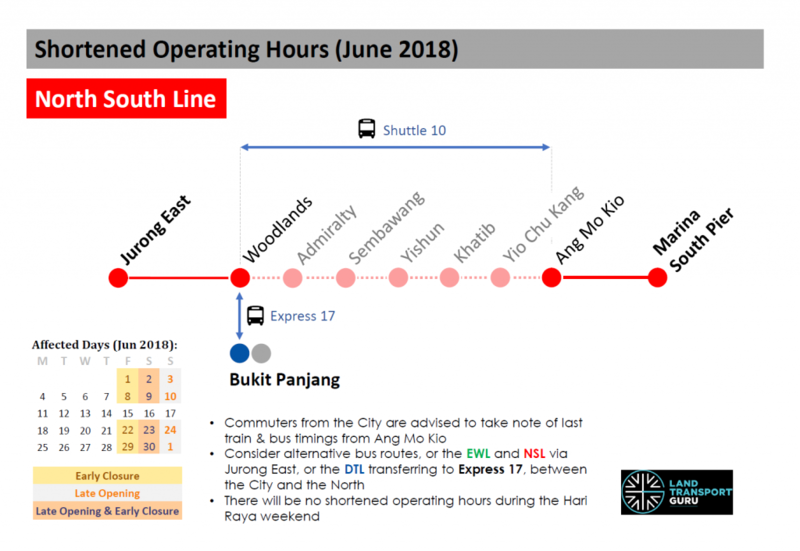 As a result, train services on the North South Line between NS9 Woodlands and NS16 Ang Mo Kio will be unavailable during the periods of closure. 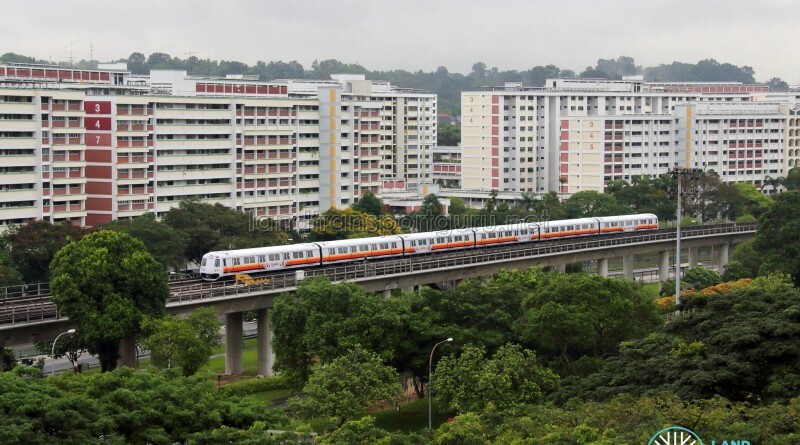 Train services between Jurong East and Woodlands, as well as between Ang Mo Kio and Marina South Pier, will not be affected. On days of Early Closure (1, 2, 8, 9, 22, 23, 29, 30 June), last trains will depart at 11:00 pm on the affected stretch. On days of Late Opening (2, 3, 9, 10, 23, 24, 30 June & 1 July), first trains will depart at 8:00 am on the affected stretch. 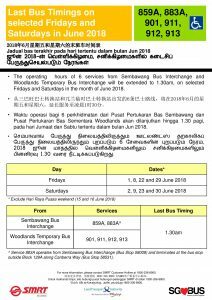 Train Service will operate as per normal on 15, 16 & 17 June 2018, during the Hari Raya Puasa weekend. 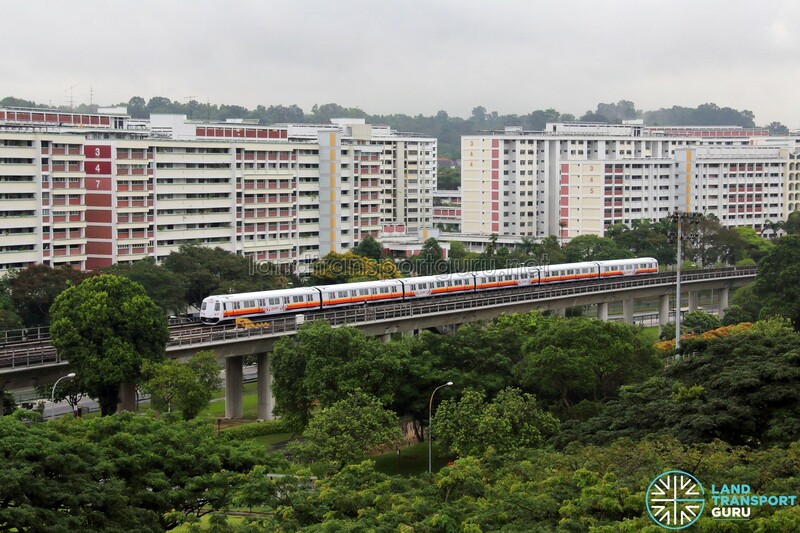 * – The last south-bound train service on Fridays and Saturdays terminates at Marina Bay. 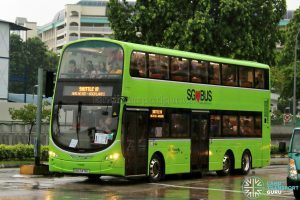 ** – The last train departing Marina Bay to Marina South Pier is at 2356hrs. Shuttle Bus Services will be provided throughout the duration of the early closures and late openings. 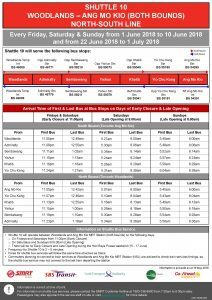 Fares for the Shuttle Bus Services are equivalent to the distance travelled by train. 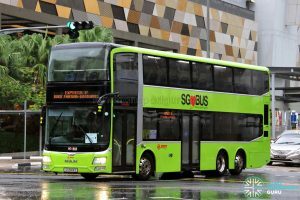 On days of Early Closure, the last buses for residential bus services will be extended to allow commuters to connect from the Shuttle Bus Services.